The Pleistocene epoch is a geologic epoch which began around 2.6 Mya (Million years ago) and came to an end around 11,700 BP (Before Present). It is characterized by lower sea levels than the present epoch and colder temperatures. During much of the Pleistocene, Europe, North America, and Siberia were covered by extensive ice sheets and glaciers. The Pleistocene was an important time because it was when the human genus first evolved. The flora and fauna today also more or less reached their current form during the Pleistocene. Most Pleistocene animals and Pleistocene plants also exist in the Holocene. Furthermore, the Pleistocene epoch was the last geological epoch in which humans had relatively little impact. The Pleistocene glaciations are among the defining geologic events of the Pleistocene. Much of North America was covered by the Laurentide ice sheet and northern Europe and Siberia were covered by the Eurasian Ice Sheet Complex. The size of the ice sheets resulted in lower sea levels and dryer climates. Britain was a peninsula and the Indonesian islands were connected to the Southeast Asian mainland, for example. There were also glaciers on Mauna Kea of the Hawaiian Islands. While parts of the world were dryer - such as central Europe, which was mostly covered in tundra, other parts of the world were wetter and greener. The American southwest, for example, contained grassland with numerous lakes. The Sahara Desert was also covered in savannah grassland for many parts of the Pleistocene. Parts of the north-eastern Arabian Peninsula were the site of an enormous oasis. It is even possible that this ancient, wetter environment may have helped inspire stories like the Garden of Eden or have been the original Garden of Eden itself. Many of the animals common today were also common in the Pleistocene. Deer, big cats, apes, elephants, and bears could all be found in a Pleistocene landscape. There were also animals that were common which have since gone extinct, such as mammoths, mastodons, saber-toothed cats, giant ground sloths , and pre-human hominins . Europe and Asia had significant populations of African fauna. Cave paintings and paleontological finds in Europe reveal that rhinoceroses, lions, and hyenas were all common at that time in southern Europe. The island of Sicily was also inhabited by a dwarf elephant species until surprisingly recent times. Northern Europe was covered in glaciers and inhospitable, while central Europe was tundra. Southern Europe, however, contained forests and was inhabited by numerous species of megafauna, most of which have since died out. Lions were also much more common in Asia, as were rhinoceroses and elephants. There were even rhinoceroses living on the islands of the Philippines. Apes were also more common. Until about 300,000 BP, Gigantopithecus, possibly the largest ape ever to live, flourished in Asia. Pleistocene North America is known for its impressive megafauna populations. The more well-known are the woolly mammoths and mastodons. North America was also inhabited by American lions, North American llamas, and giant ground sloths, all of which are extinct today. The continent of Australia has been separated from Eurasia since the Mesozoic. As a result, Australia has very unusual vegetation and wildlife. Pleistocene Australia was no different. Australia was inhabited by extraordinary creatures such as kangaroos the size of a rhinoceros and other giant marsupial mammals. There were also numerous giant flightless birds such as moas in New Zealand, rheas in South America, and ostriches in Africa and Asia that had to compete with large mammals. Another important development on the Pleistocene timeline was the emergence of the human genus: Homo. Humans probably evolved out of bipedal apes, such as the Australopithecines and Ardipithecus Ramidus . These early bipedal apes are classified as hominins. 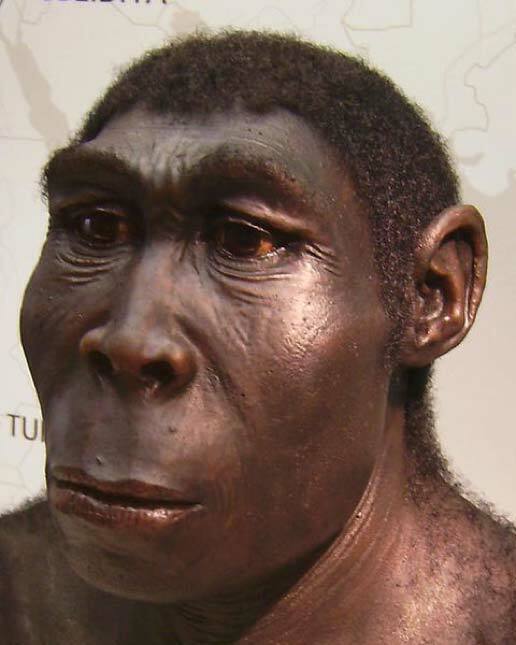 Hominins first evolved near the end of the Miocene epoch (25-5 Mya) in south and east Africa. Other than their upright posture and bipedalism, these hominins were not significantly more human than previous apes. Their skeletons indicate that they resembled modern apes such as chimpanzees and their use of tools was limited or absent. At the beginning of the Pleistocene, however, a new type of hominin appeared. These hominins were taller, more dependent on upright locomotion, and had larger brains, which allowed them to excel in tool use over any previous hominin. These hominins belong to the genus Homo and hominins in this genus are simply called humans. The earliest human species was Homo Habilis . The first examples of this species appeared about 2.3 million years ago. They used simple flake tools which were made by taking rocks and striking sharp flakes off other rocks - which could be used as cutting tools. Homo Habilis was more technologically inclined than its hominin predecessors, but it was still closer to earlier and more ape-like hominins than modern humans. The next earliest human species is Homo Erectus . The first H. Erectus evolved around 2 million years ago and the last of them did not die out until sometime within the last 100,000 years. Archaeological and paleontological evidence suggest that they may have been the first humans to use culture as a wholesale approach to adapt to their environment. 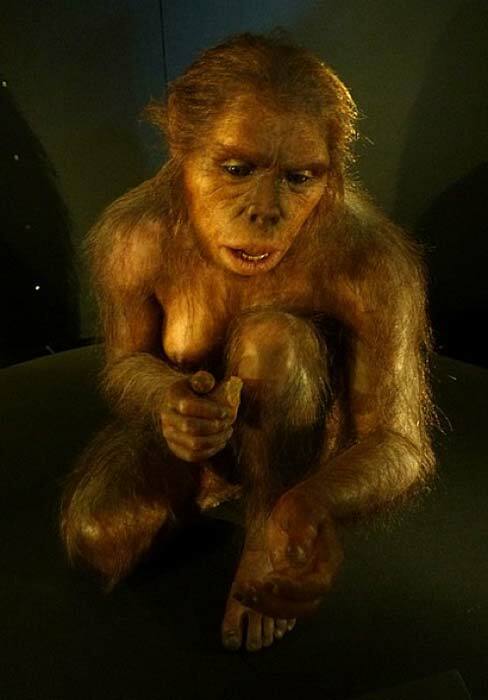 They were more advanced tool users and were also much taller than previous hominins, about six feet (1.83 meters) tall. They were also the first humans to leave Africa. By 1 million years ago, H. Erectus had spread to both Europe and Asia, bringing humans for the first time to these regions. The earliest humans were universally hunter-gatherers. Their use of technology to interact with their environment made them very adaptative - so that humans eventually found their way into every possible environment on the planet: forests, grasslands, deserts, even tundra. Megafauna Extinctions in the Pleistocene: Accelerated by Humans? For most of the Pleistocene, humans did not significantly impact their environment. There were no more than a few hundred thousand individuals at a given time and their ability to transform the landscape was limited by primitive technology and limited social organization. This all changed with the emergence of Homo Sapiens (modern humans) in Africa and Homo Neandertalensis (Neanderthals) in Europe. Anatomically modern humans first evolved in Africa around 200,000-300,000 BP. After the emergence of anatomically modern humans, something happened, perhaps a rewiring of the human brain , that led to the emergence of modern behaviors like art, blade production, long distance trade, and more efficient, organized hunting, among other abilities. This change in behavior caused humans to have a significantly larger influence on their environment than in previous times. This can be seen in the fate of most megafauna, especially in the New World. 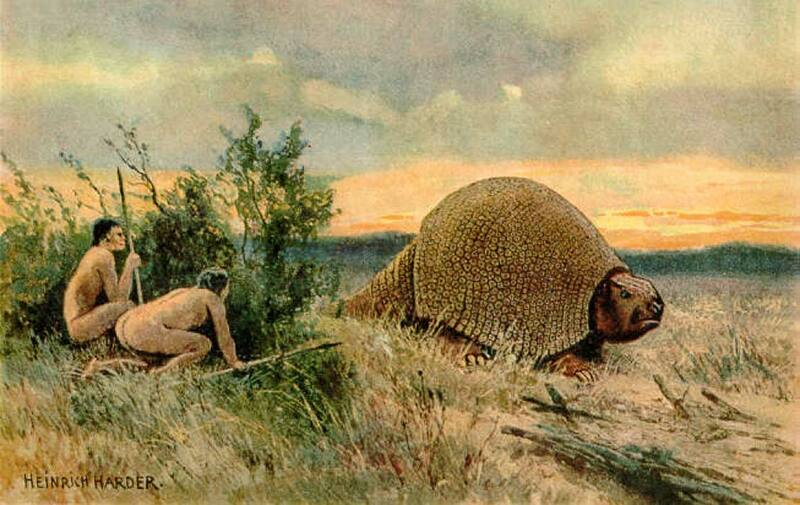 Megafauna extinctions occurred around 40,000-50,000 years ago in Australia and around 13,000 years ago in North America. Both occurred shortly after the appearance of humans on these continents. It has been suggested that the reason for the worldwide extinction of megafauna at that time was overhunting by humans combined with climate change. The climate was constantly changing during the Pleistocene and the megafauna survived these changes. When humans were introduced into the environment, however, these same megafauna populations died out not long afterwards. It is possible that the addition of a powerful predator, like humanity, may have added an extra factor that was just too much for the megafauna to handle while also adapting to climate change, leading to their extinction. As humans become more technologically advanced and more adept at manipulating their environment, they continue to influence it more and more. How much longer human civilization will last is uncertain, but one thing that is known is that humans are likely to leave a mark on this planet which will last for ages to come and it all started in the Pleistocene. Barnosky, Anthony D., et al. "Assessing the causes of Late Pleistocene extinctions on the continents." science 306.5693 (2004): 70-75. Zimov, Sergey A. "Pleistocene park: return of the mammoth's ecosystem." Science 308.5723 (2005): 796-798. Patton, Henry, et al. "Deglaciation of the Eurasian ice sheet complex." Quaternary Science Reviews 169 (2017): 148-172. Kaufman, Darrell S., Stephen C. Porter, and Alan R. Gillespie. "Quaternary alpine glaciation in Alaska, the Pacific Northwest, Sierra Nevada, and Hawaii." Developments in Quaternary Sciences 1 (2003): 77-103. Thorne, Robert F. "A historical sketch of the vegetation of the Mojave and Colorado deserts of the American Southwest." Annals of the Missouri Botanical Garden (1986): 642-651. Larrasoaña, Juan C., Andrew P. Roberts, and Eelco J. Rohling. "Dynamics of green Sahara periods and their role in hominin evolution." PloS one 8.10 (2013): e76514. Rose, Jeffrey I., et al. "New light on human prehistory in the Arabo-Persian Gulf Oasis." Current Anthropology 51.6 (2010): 000-000.
spotted hyenas and steppe lions in battle and competition about prey." Paleontology Journal 2014 (2014). Second sentence should say <em>lower</em> sea levels, not higher.